But, you know, I think that’s maybe the underlying message of the whole book? That I haven’t figured out in 25 years of reading the book? 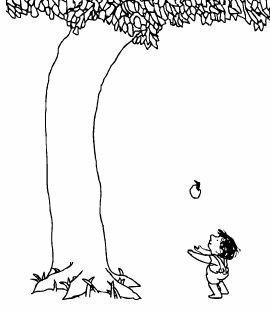 The tree loves the boy and gives him everything he needs to be happy, expecting nothing in return. Yep, that about sums up parenthood. I guess I just hadn’t thought about it. Now, I just keeping thinking, “Duh, Beth.” And yeah, those sweet moments make all the not-so-sweet ones totally worth it. I love this. The profundities of childhood amaze me as a nanny. And they don’t even realize they’re saying something you’ll never forget and always cherish.